Dawn (Jenkins) Banks was born November 15, 1968 in Springfield, Ohio to Shirley Ann Jenkins and Darryl Jenkins. Dawn loved her family and friends above all else. 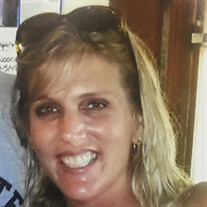 Defined by her sweet, caring, and giving disposition, Dawn had a warm smile and infectious laugh that could make anyone feel at home. As a beloved mother, aunt, sister, and wife, Dawn was a source of strength, encouragement and support like no other; always there and in your corner if needed. Dawn was a long time employee of Big Bear and most recently, Synchrony Financial, where she fostered many relationships with coworkers whom she would come to call dear friends. Dawn departed from this life on October 19th, 2018. She was preceded in death by parents Shirley Jenkins and Darryl Jenkins, a brother Dennis Jenkins, a brother-in-law Joseph L. Banks, and a niece Erin Baumgardener. Dawn leaves behind to carry on her legacy and cherish her memory a devoted son Jalen Banks, husband Mark A. Banks, brothers and sisters Vickie Jenkins, Buddy Jenkins, Dale Jenkins, Tammi Rosales, and Penny Sue Stidham; nieces and nephews Brad Rosales, Sara Rosales, Matthew Jenkins, Darrin Jenkins, Trevor McCorkle, Mandi Adkins, Sunnie Jenkins, Jeff Jenkins, Dustin Jenkins, Joseph D. Banks, Nisha Banks, and a host of other family and friends whom she loved very deeply.